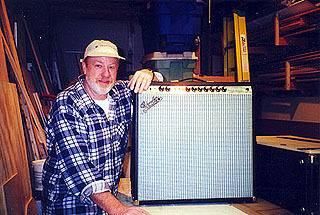 A number of years ago I began to rebuild older vintage amps and speaker cabinets. 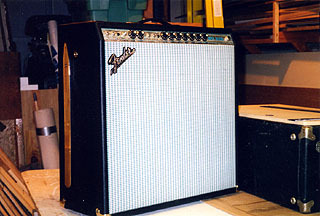 I was contracted to reproduce several decades-old Fender amps, from the ground up. I started with just the chassis and then built new cabinets around them, using vintage woods and coverings, assembled them while adhering to the original dimensions. The result was a new-old product with still the sound of the original. This concept led to our building custom speaker caninets for bass guitar players. Our custom building business, where we build them one at a time, allows for great attention to detail, as well as a long list of options for the buyer. If you can't find it out there, chances are we can design it according to your specs. Since custom building is our passion, we keep every aspect of it in-house. We don't out-source our boxes; we build each one in our own shop. And we cover them, install all electronic components, and load the speakers ourselves. How good are our cabs? Daily, our pro players compare us with many leading speaker builders. The local bass playing community has accepted our product with steadily increasing accolades. We have sold cabinets from here to Florida and to California, and to players in several foreign countries as well. If your passion is great tone, good looks, and solid construction, and all at a very reasonable price, then we urge you to look at our cabinets. Call us with your custom ideas. We hope you will find our new web site informative and helpful. Our custom cab photos will show you just how many different cabs we have designed and built, so far. Would you like us to design one for you? Then we'd love to hear about your custom cab ideas.